Using a Kindle to post for most of the past week meant I couldn’t upload photos. 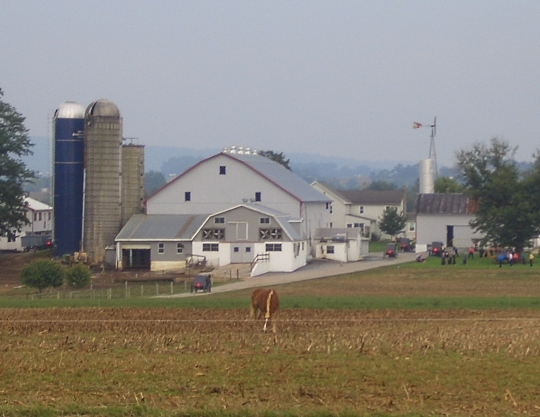 Here are a few I’d like to have included, mostly from Lancaster County. It was an overcast week, or at least it seemed to be whenever I pulled out my camera. I saw a balloon in the air. I am short so anything seems high off the ground but the hanging wash seemed very high up. Do they stand on a stool or something to reach it. Or am I just short. The clothes lines are usually hung through a pulley, allowing the women/girls to stand on the ground then when that length of line is full just pull it to the next and so on. Wish I had a pully from my basement to the upstairs for my wash. I could never do wash like the amish. I feel like I do wash 24/7. Funny though My hamper is always full. Eric, These are some really good pictures, thanks for posting them. 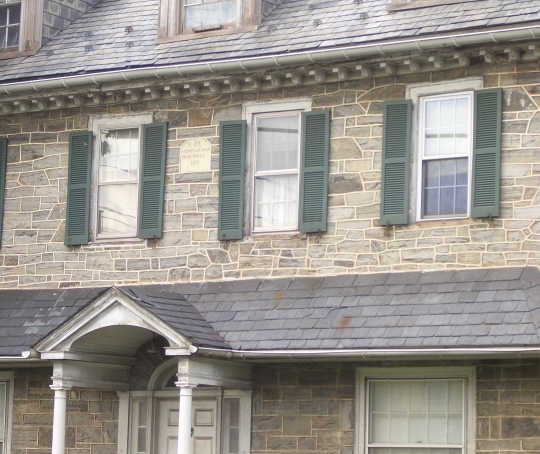 I enlarged the old Lancaster home to read the name stone, but wasnt able to make it out. 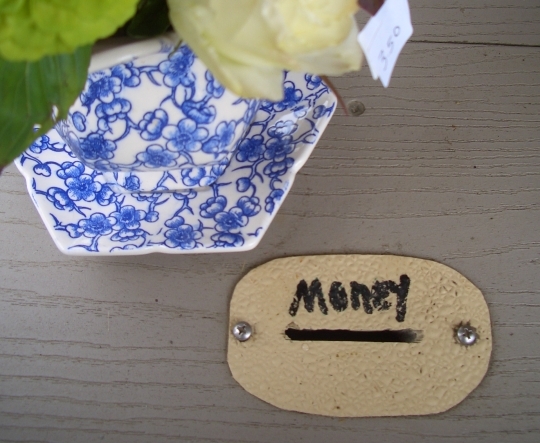 Could you tell us what it says? Thanks! I’d love to know what kind of clothes line they use to span that kind of distance without sagging. My line is a bit too long and stretches out, requiring me to constantly adjust it. (I really should rig up multiple, *shorter* lines.) Is it some kind of cable, and if so, does it leave marks on the clothing? I use a similar type of clothesline. They have a tightener in them, and they are a cable covered with plastic now. They used to have to be anodized so that they wouldn’t leave rust marks. We also have a device that takes up the lower side of the line and hooks it to the upper line. I used to do all my wash by hand, but we have moved to a house with a washing machine, which is nice this year, as I have had bad eczema on my hands. 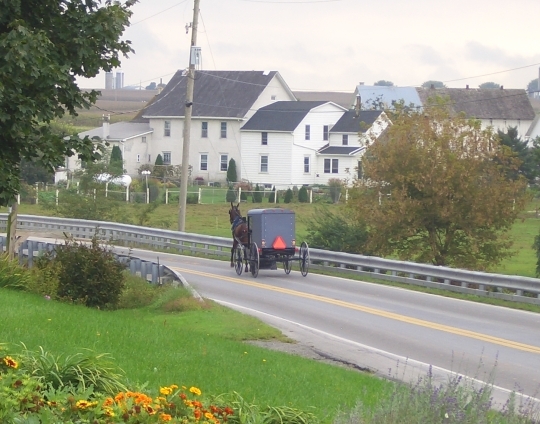 Most Amish have a gas powered wringer washer rather than old washtubs and a hand wringer. @Peggy, perhaps that line goes to a second story window, so they hang and remove from inside. Not sure..just a guess..
Love seeing the pics of my hometown. I am visiting next week wich is always bitter sweet. I love to go but I hate leaving. I too Live in NC. And I have to say I really dont look at NC as home. But I married a local boy guess I am here to stay! But Lancaster will always be my home. My guess about the clothesline would be that it’s just old fashioned cotton. Years (well over 50) ago, my mom and Busia used to hang our clothes on a pully from the second story back porch window extending to (I think) either our garage/shed roof or a dead tree trunk in our yard. As a kid, I thought it was pretty cool that you could make the wet laundry move outside to dry! My guess is that with a cotton clothesline (which my mom and Busia always used), being out in the rain and sun, it would shrink up and stay pretty taut. Also, you could “adjust it” by tying it or cutting it a little shorter if it sagged. (I like cotton better than cable (etc. ), too. Also, when it was “old”, I’d get a really nice, long jumprope out of the deal! Ruth is right, the clothes line is on a pulley which you rotate and it moves the clothes in and out, so you can do it all from one spot, no jumping or climbing or leaning out windows needed! 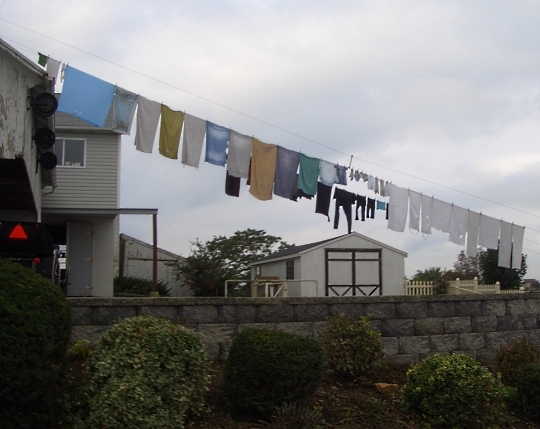 I really have a soft spot for these clotheslines–last Saturday was a big laundry day in Lancaster since it was somewhat dry amid all the rain–lines were hung everywhere. Something beautiful about them. I was down in the south end of the county and wish I could’ve taken a photo–there was a line that was strung high across the road, from the house to an outbuilding the family owned on the other side of the street. So you drive right under the trousers and shirts and towels. Classic! Thanks for the picture of the New Testament in German. I always wondered what it looked like. 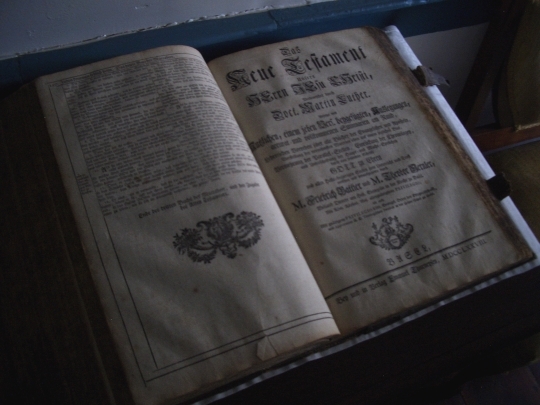 I believe that is an Old High German New Testament. The black letter type is very hard to read. what is the difference in German and old high German?? High German is the formal language that you might learn in school and I think it’s considered the national language. I learned High German in college (it did not stick, I can read PA Dutch much better!) My mother’s family speaks a different dialect that would be considered Low German by the High German speakers. It sounds similar, and a High German speaker and Low German speaker can communicate, but there are words that are completely different. 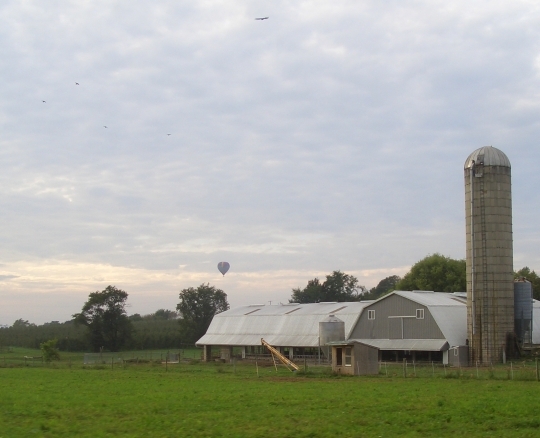 Oh, when I stayed in Lancaster two weeks ago we saw many hot air balloons. One of them even landed in the field across from where we were staying. It was very cool! Thanks for the pics, Erik, they’re awesome! I’m already missing PA! Been going there since I was really young! Can’t wait to go back. Thank you for sharing your pictures really enjoy seeing them. Thank you for the beautiful pictures. I was in NC the past two weeks and went to Halifax County, VA to the Amish community. There was a double wedding that day and not a person to be seen. Great pictures as always Erik….love them……keep them coming…did you get some good recipes too? Bet you had lots of yummy food eh? Anything in particular that you haven’t shared before with us ? My favorite are the fried pies…..I love those…..haven’t tried the whoopie pies yet…..what kind of cream filling is between the layers ???? They look so yummy…..last time I went to an Amish bakery, I purchased a black walnut pie and OMG was it ever delicious……much better than a pecan pie…..have you tried it yet ? 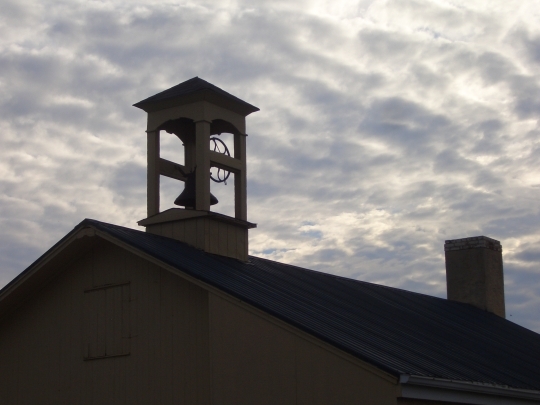 The picture of the bell makes me think of the film Witness. I like how that photo looks, all silhouetted, very well done in all those pictures.